RMTC provides horseback riding therapy to nearly 200 children with physical and mental disabilities as well as emotional and behavioral issues. 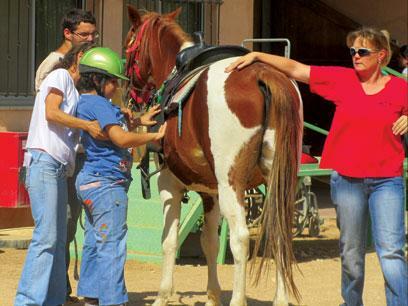 Jewish National Fund (JNF) has a longstanding partnership with the Red Mountain Therapeutic Riding Center (RMTC) at Kibbutz Grofit. Located 45 minutes north of Eilat in the Arava Valley, RMTC provides horseback riding therapy to nearly 200 children with physical and mental disabilities as well as emotional and behavioral issues. Therapeutic riding is a costly treatment that requires numerous players—including trained horses, riding instructors, doctors, psychologists, physiotherapists, and educational advisors—as well as specialized equipment and accessible facilities. Each year, JNF’s Sapphire Society provides scholarships for RMTC’s “Day of Studies” after-school program, which offers special education classes and recreational programs to hundreds of participants ranging in age from kindergarten to high school. RMTC is staffed with a team of licensed therapeutic riding instructors, ranch workers and volunteers who serve as side walkers and horse guides and make therapy possible for young riders. The facility houses three riding arenas, more than 20 horses, two corrals, bridle paths, wheelchair-accessible sidewalks, stables, classrooms, and a zoo. Therapeutic riding has been widely used since the early 1950s as a tool for improving the lives of people with a range of cognitive, physical, and emotional impairments. Since its establishment in 1996, RMTC has worked towards the development and advancement of this unique therapy in the southern Arava, making it accessible to the population of a remote region that lacks many other essential medical services. Individuals with almost any cognitive, physical or emotional disability can benefit from therapeutic riding, driving, vaulting, competition or other purposeful, safe and supervised interaction with horses. Because horseback riding gently and rhythmically moves the rider’s body in a manner similar to a human gait, riders with physical disabilities often show improvement in flexibility, balance, muscle tone, strength, posture, coordination, and motor development. For individuals with mental and emotional disabilities, the unique relationship formed with the horse can lead to increased confidence, patience, self-esteem, and independence. Riding has also been shown to improve communication, cognitive skills, social interaction, and overall emotional well-being. Many participants spend their days confined to a wheelchair or walker, but on the back of a horse, they often discover that they can achieve the very things they thought were impossible. There’s a connection that develops between riders, horses and volunteers—a bond of love, caring and trust. And there are miracles, like the little girl who had never uttered a word but began speaking to her horse, or the little boy who had never been able to support his own weight and is now learning to walk on his own. Part of what makes such a simple activity an effective therapy is that it normalizes and builds self-awareness within the patients. A horse cannot tell that its rider has a disability, and its acceptance is unconditional. At the same time, the rider feels a sense of accomplishment and control that can be lacking in much of his or her daily interactions. Over the past 111 years, JNF has evolved into a global environmental leader by planting 250 million trees, building over 220 reservoirs and dams, developing over 250,000 acres of land, creating more than 1,000 parks, providing the infrastructure for over 1,000 communities, bringing life to the Negev Desert and educating students around the world about Israel and the environment. Therapeutic riding has been widely used since the early 1950s as a tool for improving the lives of people with a range of cognitive, physical, and emotional impairments. I am hoping to discuss this & related issues, please: Therapeutic riding has been widely used since the early 1950s as a tool for improving the lives of people with a range of cognitive, physical, and emotional impairments.